It’s been a terribly cold weekend, but my sister and I still managed to get out and do some fun girl shopping together at Home Goods! I could spend so much time in that store, it’s one of my favorite places to go! We went to visit Sean’s Grandma on Friday, who lives a few hours away from us. Since we took the day off on Friday, we are doing school today. My children are more aware of the school holidays now that our boys are playing basketball at a private school. 😉 I always tell them we get to take our own school holidays, which don’t line up with public or private schools! 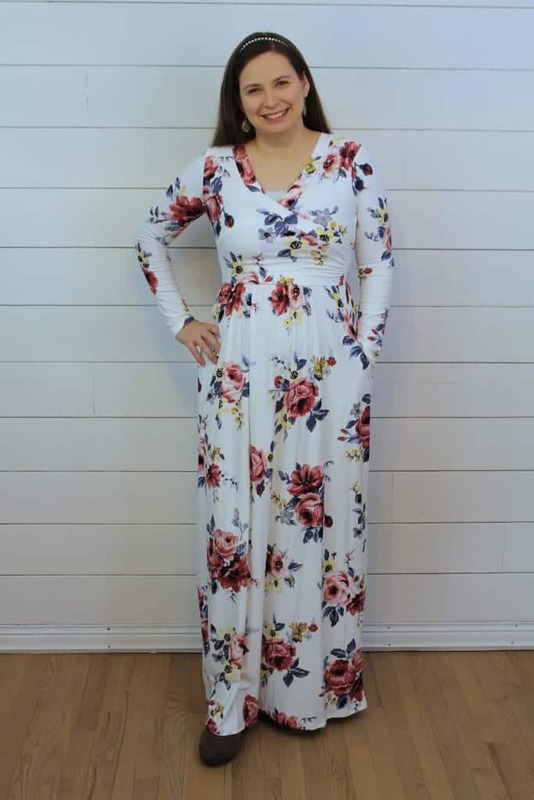 I love these long sleeve floral dresses from Deborah & Co. This is the New Ivory color, and it’s such a great dress if you are a breastfeeding mom! I wear this style dress to church all the time, and just use a nursing cover to easily nurse Emily in public. It’s really nice to have dresses to wear on Sunday, so I don’t have to worry about putting an outfit together on what is already a super busy morning! Dress – Floral dress from Deborah & Co.
« HOT! $10 To Spend at ULTA! This is a beautiful dress and I love the longer sleeves. Sounds like a fun weekend and I am glad that today is a holiday. It’s so gorgeous!!! I’m in love with that dress! That dress is absolutely beautiful on you!